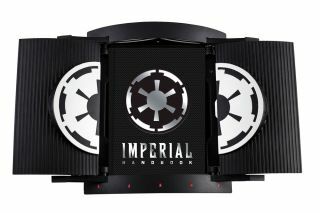 The deluxe edition "vault" containing the "Star Wars: Imperial Handbook." The vault features an electronic opening mechanism, lights and sound. Delia Greve is a senior editor of becker&mayer! Book Producers and editor of the "Star Wars: Imperial Handbook." Greve contributed these responses to Space.com's Expert Voices: Op-Ed & Insights. The Star Wars "Imperial Handbook: A Commander's Guide" (becker&mayer!, 2014) launched this fall to give fans insight into the technology, philosophy and culture of the Empire's military. The book is heavily illustrated and provides deep context to the film-game-novel universe, the fourth such installment following works about the Jedi, the Sith and the bounty hunters' code. See images from the book in "The Star Wars Imperial Handbook: A Commander's Guide (Gallery)" and learn more about the project from its editor, Delia Greve, below. 1. Where did the idea for the Imperial Handbook come from? ​Knowing the Imperial Officers and stormtroopers are fan favorites, we felt it was time to explore the Imperial military. The Imperial Handbook is​ the fourth in our series of deluxe "in-universe"​ ​titles. The previous titles were "The Jedi Path," a training manual for students of the Force, "Book of Sith," a collection of dark side texts, and "The Bounty Hunter Code," Boba Fett's copy of the bounty hunter's guild handbook. ​2. The art and backstory for Star Wars films and books include a great deal of technology. Who do the artists work with to envision those concepts? ​Many of the artists ​study the Star Wars movies, books, comics and video games that came before. Lucasfilm is also a great reference, providing guidance when developing new ships or weapons for the galaxy. Russell Walks, artist for the Imperial Handbook: "For the Imperial Officers' Handbook, I designed several pieces geared specifically towards the type of people the Emperor might want as officers: Men and women for whom conformity is security, and for whom the ultimate reward would be death in the service of the Empire." 3. How much of a role did George Lucas have in the creation of this book, and how do you ensure that you adhere to Star Wars canon? ​These books couldn't happen without the folks at Lucasfilm licensing. They oversee all pieces — editorial, design and content. The amazing Leland Chee at Lucasfilm reviews the content to make sure the content fits into the stories and lore of the Star Wars galaxy. 4. Can you share a bit of insight into how the handbook text was written? With so many elements, where did all of the ideas come from? Daniel Wallace, the author, is a Star Wars expert, who has penned several books about the franchise as well as those set in-universe. This book started with a basic question: "What would a newly promoted commander in the Imperial Military need to know?" From there, Dan began to craft the content and how the book would break down. 5. This book is a great showcase for Star Wars artists — what are some of the venues or websites you use to scout talent? ​Most of the artists we use are Star Wars experts themselves, having drawn for various books, games and Lucasfilm products. Many of them come to us as recommendations from Lucasfilm, as well as artists we connect with at ComicCon, Star Wars Celebration and other comic conventions. 6. Are there any clues in the book to guide readers on what to expect in the much anticipated Star Wars Episode VII? Imperial Handbook delves into the history of the Imperial military and its doctrine within the expanded universe.